Shuttle technicians crowd around a monitor during landing gear checks for the Discovery orbiter. A boroscope was used to scan for cracks in the landing gear - none were found - after defects were detected in similar units aboard the Atlantis shuttle. CAPE CANAVERAL - About twomonths since workers hailed Discovery's roll to the launch pad, they are aboutto move the shuttle back to Kennedy Space Center's Vehicle Assembly Building. Overnight, starting at 2a.m. Thursday, a crawler-transporter will carry the shuttle back along thecrawlerway. In the VAB, it will bemated with a new fuel tank that has a heater designed to prevent ice fromforming. Ice and insulating foam,like the piece that caused a deadly breach in Columbia's wing, are the mostcommon sources of debris from the tank during launch. Tests reveal that, withoutthe new heater, ice buildup could be a problem on part of the tank as it isfilled with cold propellants. This morning, workers planto test Discovery's auxiliary power units, which run the hydraulic system thathelps steer the orbiter. 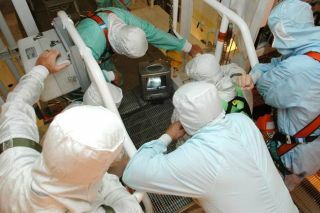 Meanwhile, they havecompleted up inspections of the ship's landing-gear doors. A small crack on sistership Atlantis prompted the checkup. Unlike Atlantis,"inspections at this point show there are no indications of any cracks inthat area," NASA spokeswoman Jessica Rye said Tuesday. Discovery rolled out to Pad39B on April 6 and is expected to roll out again in mid-June. NASA officialshope it will fly during a launch window that opens July 13.